This mini tote is made of heavy weight canvas and is lined. The cat design is embroidered on the tote. The tote is 12" high x 8 3/4" wide. A long 22" carrying strap means it is designed for over the shoulder use. 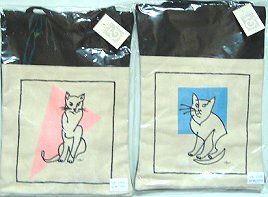 The cat on the left is presented against a pink triangle (sold out). The cat on the right is presented against a blue square. These mini cat tote bags are new, discontinued styles.